This truck is always in Montrose and I photograph it every single time I visit. I know so many of you have been so eager for this travel guide to be published and I am so thrilled to finally share all of my favorite Houston gems with you today! Considering just how close and accessible Houston is to Tulsa and of course Lin’s family living there, I have spent my last seven Thanksgiving holidays there and have yet to share. (well there have been a few things here and there) But it was time to really put a good itinerary together for you! And while this one is a bit long and picture heavy, I promise that you will get so much out of it for your Houston travels so bookmark this one! There will be a second part for you too this week with my favorite places to Sip and Play. You will love the shopping guides. We have grown to love this picturesque and interesting city very much. In fact every time I visit The Magnolia City, I enjoy it more and more. As a creature of habit, I do tend to visit a lot of the same places because I love them, but always add something new to my trip each time. And thanks to my friend Karen who lives there, she is always keeping me in the loop of the newest and greatest! But I definitely have my Houston staples as I like to call them! Each and every one is highly Instagrammable too! Grab a pic at The Biscuit Paint Wall. We always stay with Lin’s mom but I am such a fan of ZaZa. I would love to branch out and experience a stay here over a future visit! It’s always been a fave in Dallas and they are even building one in Austin. If you are a lover of design like me, then book at Hotel ZaZa located in The Museum District. Hotel ZaZa Houston is an unexpected feast for the senses. Introducing business and leisure travelers to a larger than life experience, this unique choice in Houston boutique hotels boasts a collection of exquisite guest rooms and suites, including Pool Villas, Concept Suites and The Magnificent Seven Suites, award-wining dining at Monarch Bistro and a relaxing day spa onsite. I have toured the property and had drinks here and it’s a beauty from start to finish. The lobby is exquisite, the pool area is an idyllic haven for warmer days ( which it’s Houston—almost everyday is warm) and their restaurant is delish. And location wise, well you hit the jackpot with this hotel as it literally in the heart of where you will want to be exploring! Tiny’s No. 5|Tiny Boxwoods - 2 locations and I love both equally so I rotate! Tiny's No. 5 is located in the heart of "downtown" West University. I adore the spacious patio with shaded tables beckons, a pristinely manicured lawn provides a relaxing focal point, and an airy, white-walled space feels elegant and classy. The roomy wicker armchairs are quite cozy too making this a great place to work also if you need to do some things remotely. Tiny Boxwoods (the original) began as a simple espresso bar and café inside the lovely landscapes of the Thompson and Hanson nursery but has grown into a cult Sunday brunch spot. I love the French Provençal touches! The house migas are one of my faves on the menu for brekkie- eggs scrambled with cheese, sausage, potatoes, peppers, onions, tortilla strips, tomatillo salsa and blistered tortillas while Lin and Jan always go for the West U Special which is scrambled eggs, mother’s sausage or bacon, jalapeño cheese grits, homemade biscuit and homemade strawberry jam. For lunch I love the classic Caesar salad. And do indulge with the donut holes or munchkins as I have renamed them. They are actually Jan’s fave thing ever! Oh and don’t forget their signature chocolate chip cookies! My pics from here are always so festive as it’s holiday season! Tiny’s Milk & Cookies- Baron Doke spent 3 months obsessing over creating the perfect chocolate chip cookie as I mentioned above. Since its humble beginnings, that cookie has gained a following all on its own. They had been dreaming about one day building a shop that the famous cookie could call home, and now that dream is a reality. Milk & Cookies is a walk-up bakery, coffee & ice cream shop in the heart of West U. Frozen cookie dough is available at their bakery too! The sugar cookies are so cute too! The Kitchen at The Dunlavy - This is one of the restaurants that is apart of Clark Cooper Concepts and I so enjoyed being hosted by them on my most recent November trip. It was so fun getting to know Shannon and it was equally as fun touring their restaurant group. So appreciative to Visit Houston for the introduction. The Kitchen at the Dunlavy caters to the city’s diversity in a communal, order-at-the-counter, casual atmosphere. Bright chandeliers highlight the vast windows overlooking the natural beauty of the Buffalo Bayou Park. The views are exquisite and make me feel like I am dining in a glass treehouse. The menu offers up some delicious brunch favorites and let me tell you chef Jane Wild does not disappoint. Everything that appeared in front of our eyes was truly delicious and if there's anywhere that belongs on your restaurant visit list for 2019 (don't we all have one of these?!) it's The Dunlavy. So promise me, next time you're in the area you'll go? Get the Coddled Egg—fine herbs, Yukon gold potato, June's joy goat cheese with sourdough toast! And try the honey lavender Latte! Jan was a huge fan of the breakfast sandwich too and of course we loved the pastries and smoothie! You can also host your special event here! The Dunlavy is a private event and dining space, by night, encompassing the natural beauty of the park setting. It is perfectly scaled for intimate gatherings and celebratory occasions: from your dream wedding to a cocktail reception, art installation or board retreat. The personalized setting and culinary experience created by the Clark Cooper Concepts' team will ensure a memorable, stunning and thoroughly enjoyable event. The Dunlavy can accommodate parties of 110 seated indoors and 50 seated on our outdoor patio. For cocktail receptions, indoor capacity is 200. Punk’s Simple Southern Food- This is another delish gem from Clark Cooper Concepts! How can you possibly go wrong with Deviled Eggs, Sweet Corn Hushpuppies, homemade biscuits and jam, and Buttermilk Fried Chicken?! We could not resist the chicken pot pie—an individual pot pie with flaky pie crust filled with chicken and vegetable gravy, served with a small farmers salad. And the pimento cheese dip is out of this world good- served with ritz crackers, celery sticks & carrots. And the 'NANA PUDDIN' was one of the best I have ever had. Oh em geee..take me back! This is a great place to watch a sporting event on tv too! Brasserie19- also from The Clark Cooper Concept group. With its crisp white interior and gorgeous table-hopping crowd, Brasserie 19 is easily the most see and be seen restaurant in town. The high-octane ambience is fueled by one of the city’s best wine lists – an unconventional approach to pricing that has every table topped with a bottle. (the wine prices are seriously the best that you have no choice but to order the whole bottle or two or three, shhh I won’t tell.) My friend Karen and I had the best Frenchie lunch here and were completely spoiled. Here is what we ate!! ESCARGOT broiled with parsley butter, roasted garlic, and parmesan, brie with an apricot chutney and pistachios, a classic FRISÉE salad with a poached egg, bacon lardon, and dijon vinaigrette, the Brasserie 19 steak frites— a10 oz. Prime New York Strip with pomme frites and maitre d' butter, along with espresso and Crème Brûlée. And of course there was Rosé. Rosè can be enjoyed all year round in Houston with the warm temperatures and I suggest The Dunlavy Rosé. Our meal was exquisite!!! And the service was stellar too. This place is in a great area too so you can burn some calories walking and shopping at all the nearby River Oaks shops and make a day of it! We sure did. Giacomo's Cibo e Vino- This is one of our must-eats in Houston even sometimes eating here twice or more. Giacomo’s is a casual, neighborhood Italian cafe and wine bar specializing in small plates of hot and cold antipasti for grazing, sharing, mixing and matching. All food is prepared from scratch using the best local, imported and all natural ingredients available. And I have yet to taste one thing I do not dream about. What I would give to transport this place to Tulsa. Relish Restaurant & Bar- Relish Restaurant & Bar is a neighborhood eatery in River Oaks/ Upper Kirby District and I love enjoying cocktails and small nibbles on their patio. They serve up classic American food with Mediterranean influences. I love the deviled eggs deviled eggs— horseradish, crispy fried chicken, and maple drizzle! And I always treat myself to one of their HEMINGWAY DAIQUIRI’s— Flor de Caña Rum, lime, grapefruit, and maraschino. Marché- La Table Houston- Adore this casually chic, seasonally driven French Bistro so much!!! Located on the first floor of La Table, Marché’s casual seating, wrap-around bar, and open-air patio welcome diners for an all-day menu of light, yet comforting French bistro-style fare. Indulge in dishes such as their Caramelized Cheese Soufflé, Roasted Vegetable Cassolette, or Roasted Chicken Au Vin; or, enjoy a light Mushroom Flatbread or Yellowfin Tuna Niçoise Salad al fresco alongside a glass of wine or signature cocktail. Marché also offers a Prix-Fixe lunch, weekdays from 11am-3pm. Oh and all the Assouline books live here!!!!!!! Vieng Thai- I love finding good Thai food wherever I travel and Vieng Thai is the real deal. Located in Spring Branch at a discrete shopping center, come discover where you can find authentic Thai home-style cooking. A casual family friendly restaurant, Vieng Thai is one of Houston's hidden treasures. It’s BYOB too so we always bring a good bottle of wine or two! Just look at these delish offerings! Tacos Tiera Caliente- This popular taco truck, usually parked at the corner of the West Alabama Icehouse, is my go-to spot for tasty, Mexican-style tacos . 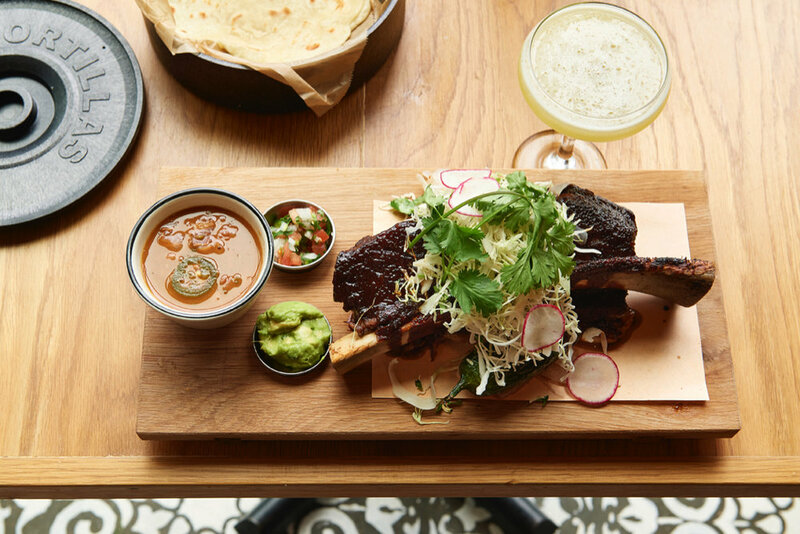 Though the barbacoa tacos are most often cited as the things to order, Tierra offers the full complement of pastor, chicharron, pollo, and more, as well as quesadillas and tortas. Beware of the hot sauce, which is really spicy. Oh and cash only! Soooo sooo good! La Vista 101- Neighborhood restaurant in the heart of Lazybrook/Timbergrove with bold flavors, great drinks, and a relaxing atmosphere. We love the small plates & appetizers and cocktails. Highly recommend the grilled Spanish Octopus pickled chilies, arugula, olive oil, hummus, zatar, sumac, and house flatbread! Also enjoyed the mussels served two ways: Italian White: lemon, scallions, garlic, tomato or Spanish Red: Spanish chorizo, potatoes, garlic, and scallions . Delish Bolognese too if you want an entree. Vibrant- I met my lovely friend Blanca here for breakfast one morning and it is fantastic. They create foods that are gluten free, dairy free, refined sugar free, corn free, peanut free, soy free, and non GMO. The eggs and meat are always pasture raised and they source local and organic whenever possible. They only use avocado, coconut, and extra virgin olive oil. No microwaves. The nutritious breads created by Karen Man are made from scratch in-house, as are their crackers, cheeses, nut milks, and yogurt. They use wine and spirits that are produced naturally, with minimal intervention, with ethical farming practices. You know what you are eating because the whole menu is transparent. All of their ceramics are handmade by Fefo for Vibrant. And I am obsessed. They also use solar energy, natural cleaners by Branch Basics, and recycle and compost the majority of their waste. La Argentina Artisanal Gelato- Best Gelato in the United States! We drove to Katy for this but they are opening a fabulous new location in Houston by the galleria. It may already be open. Daniel Mansilla accompanied by his daughter Florencia Mansilla, both born in Rosario Argentina had worked with passion and dedication to please the Texan costumers, striving to offer a quality of gelato, as they deserve and bring to them the most popular flavors from South America. They want to share something that comes from their culture and at the same time it is their family tradition. Whoa! So are you hungry yet?!!!! Be sure to check out State of Grace too. We love having their Sunday family chicken dinner at the bar! And Pondi Cherí is a must if you love Indian cuisine. And for the best Tex-Mex we love El Tiempo! Be sure to keep following along this week because I will have a second part to this travel guide where I will be featuring the best places to drink and play!!!! Enjoy Houston.